Okay, enough fooling around. It’s time to get back to work. I’ve been doodling some ideas for the next piece with nothing lighting a spark, so I spent the day yesterday in a local park with my camera looking for other people enjoying the day. I found this woman, Jan, who was kind enough to let me take a photo of her, and I think I can make it into an interesting ink drawing. 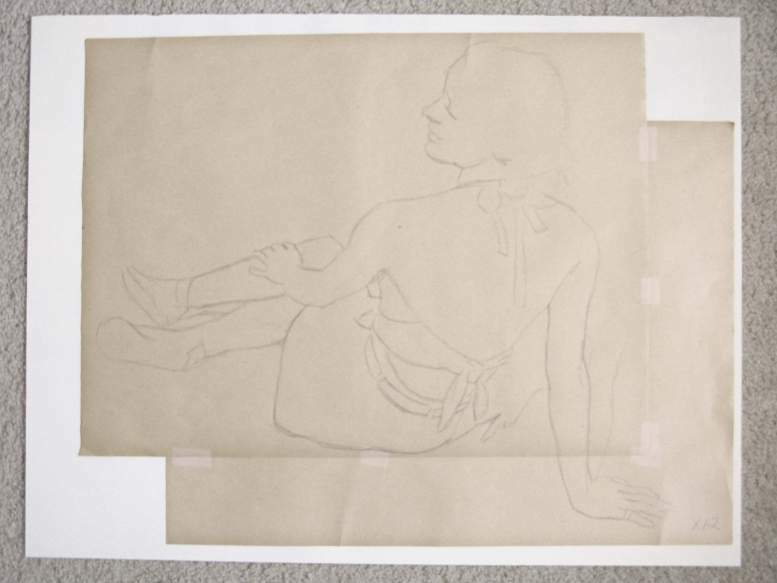 I made a small outline sketch that I enlarged to fit onto a sheet of illustration board, 20 x 30″. I think I’ll prep the board with a coat of shellac primer, so that I can scratch away ink marks, which will work well for the grass. There a a couple other things to think about before I start. She had a tattoo on her shoulder that I might either keep, change, or discard. I might also place something in the foreground, so I have some more doodling to play around with on this.